The AC Solar Warehouse Enphase Solar Distribution Board accommodates the Envoy Communications Gateway and all of the electrical hardware required to install a single-phase Enphase system with an array of up to 15kW. 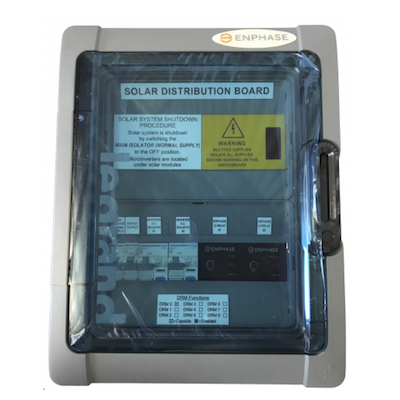 For little more than the cost of the components themselves, the Enphase Solar Distribution Board saves valuable time on site, eliminates wiring problems and speeds up commissioning. What are Enphase installers saying about AC Solar Warehouse Solar Distribution Boards? If you’re not using one of these boards your Enphase installs are taking longer than they need to. Try one on your next job and find out for yourself! If you wish to specify a custom board please detail what alterations/additions you would like made to one of the existing models. Examples of additional components are: Surge diverters, extra MCB’s, extra Q relay’s etc.